Trend in rainfall data have a great impact on the hydrological cycle and thus involve both the character and quantity of water resources. Analysis of trend in rainfall data also aids to see the result of rainfall variability on the occurrence of drought and flood. The aim of this research is to detect and estimate the magnitude of trend associated with rainfall data from Akure and Calabar which are located within the coastal region of Nigeria using non-parametric Mann-Kendall test statistics. Monthly data for thirty six (36) years spanning from 1980 to 2016 was used as input parameters for the analysis. Infilling of the missing records was done with the aid of expectation maximization algorithm which is unarguably one of the best missing value analysis techniques. Preprocessing of the rainfall data was done by conducting numerous time series validation test such as test of homogeneity, test of normality and outlier detection. 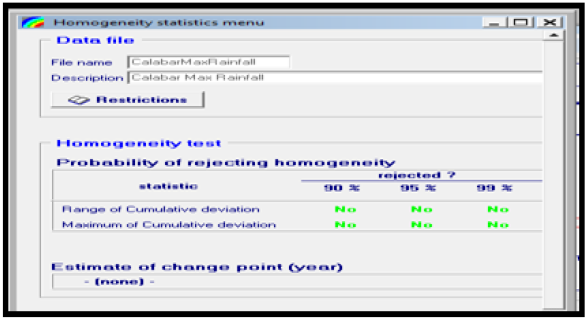 Homogeneity test was aimed at testing the assumption of same population distribution; outlier detection was to detect the presence of bias in the data while test of normality was done to validate the claim that climatic data are not always normally distributed. In addition to testing the normality assumption of the data, normality test was also employed to select the most suitable trend detection and estimation technique. Results of the analysis revealed that the rainfall data from Akure and Calabar are statistically homogeneous. The records did not contain outliers and they are not normally distributed as expected for most climatic variables. The non-parametric trend detection and estimation analysis revealed that the rainfall data from Akure shows statistical significant evidence of a decreasing trend with a computed M-K trend value of -129. 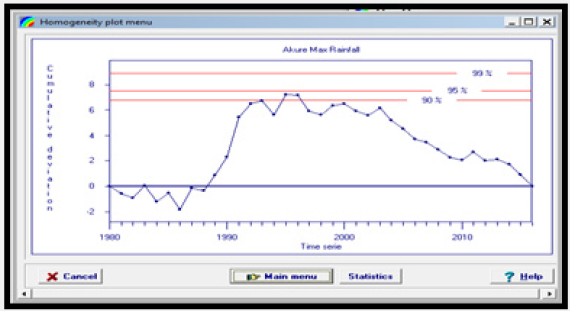 Although, the rainfall records from Calabar do not have sufficient statistical evidence of a significant trend, the computed M-K trend value was +50 which is; evidence of an increasing trend. Adequate planning and management of water resources for sustainable development is an issue of concern and have developed into a widely studied area. Accurate knowledge of the past and present trend of climatic data can aid in visualization and characterization of the water resource situation both in the past and even presently [1,2]. The trend results will not only provide a general idea of any changes noticeable within the climatic data, it will also point out certain concerns for the area regarding extreme precipitation events such as drought and flooding. Climatic data trend results will likewise suffice as a comparison for extreme precipitation events predicted by generalized time series forecasting models such as least square regression and multivariate regression model . Trend in rainfall data have a great impact on the hydrological cycle and thus involve both the character and quantity of water resources. Analysis of trend in rainfall data also aids to see the result of rainfall variability on the occurrence of drought and flood . Although numerous variables such as temperature, vegetation affects the hydrological cycle, precipitation remains the key climatic variable that governs the hydrologic cycle and the availability of water resources. Numerous studies have analyzed the changes in precipitation patterns in global as well as regional scale. Recent studies have also suggested that analysis of hydro-climatic variables should be done at the local scale rather than at a large or global scale because the trends and their impacts may be different from one location to the other . There are many different ways in which changes in hydro-meteorological series can take place. A change can occur abruptly (step change) or gradually (trend) or may take more complex forms. A time series is pronounced to have trends, if there is a significant correlation (positive or minus) between the observations and time. Trends and shifts in hydrologic time series are usually introduced due to natural or artificial changes. Natural changes in hydrologic variables are usually gradual and are caused by a global or regional climate change, which would be a representative of changes occurring over the study area. Changes in monitoring variables that may not be able to be extrapolated over a study area could be caused by a gradual urbanization of the area surrounding the monitoring site, changes in the method of measurement at the monitoring site, or by moving the monitoring site even a short distance away. The artificial change is usually mentioned in the overall record at a monitoring site, but this information is not always shown in the sites’ data series. Thus, variables that appear to have a trend may actually just represent a change in climatological conditions near the monitoring site. In such a case, the affected climatological data should be changed so that the values are better represented of the study area as a whole . A central factor in the modeling and analysis of the trend is the ability to establish whether a change or trend is present in the climatological record and to quantify this trend, if it is present. The trend in a time series data can be expressed by a suitable linear (parametric) or nonlinear (non-parametric) model depending on the behavior of the available data. The linear model is widely used in hydrology and the simplest of the linear models normally employed for trend detection is the Student’s t-test which requires that the series under testing should be normally distributed . Most importantly therefore, whether or not the sample data follow a normal distribution has to be examined prior to the analysis in order to choose the appropriate model for trend detection and analysis. Unfortunately, most researchers ignore this important check. 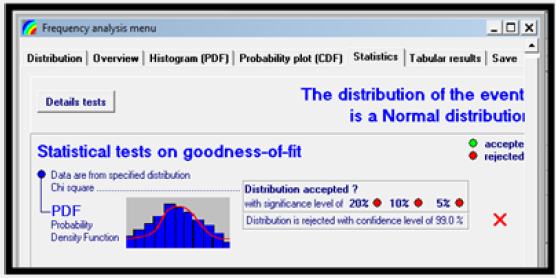 If normality is violated (if the available data do not follow a normal distribution), then, the nonparametric test such as the Mann-Kendall Test is commonly applied to assess the statistical significance of trends [7,8]. Nigeria is located in West Africa between latitude 40 N and 140 N and between longitudes 20 E and 150 E. It has a total area of 925,796km2. The ecological zones of the country are broadly grouped into three, which are Sahel, Savannah and the Guinea zones. Nigeria is affected by the Tropical Continental and Tropical Maritime air masses. The Tropical Continental is responsible for the dry season while the Tropical Maritime is responsible for the rainy season. The intervening periods of transition from the real onset and cessation of rain falls between February and April and between September and November respectively. Also a depression is indicated in the rainfall amount during the month of August and this has been named the little dry season or August break or midsummer . The Nigerian coastal zone sprawls a total of eight states, out of the thirty-six states of the Federation, namely: Akwa-Ibom, Bayelsa, Cross River, Delta, Edo, Lagos, Ondo, and Rivers. The coastal states are estimated to account for 25% of the national population. The coastal areas stretch inland for a distance of about 15km in Lagos in the West to about 150km in the Edo/ Delta and about 25km east of the Niger River. The coastline stretches for about 853km comprising inshore waters, coastal lagoons, estuaries and mangrove especially in the Niger Delta. 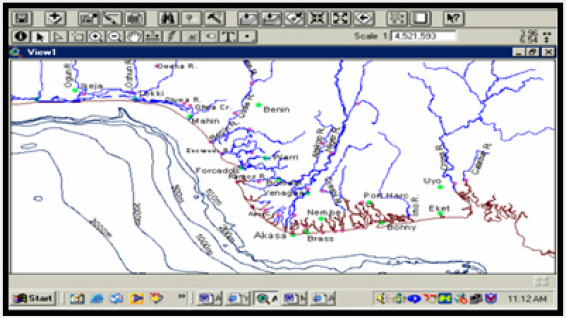 Figure 1 shows the Nigeria coastal zones. The areas chosen as case studies for this study are Calabar the capital of cross River State which is located within the coasted mangrove swamp region and Akure the capital city of Ondo State. Figure 1: Nigeria’s Coastal Zones. Table 1: Basic descriptive statistics of annual rainfall data. 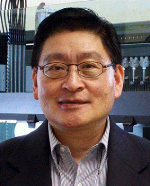 The test is usually known as Kendall tau statistics and has been widely used to test for randomness against trend in hydrology and climatology. It was employed in this study because it is a non-parametric ranked based procedure which is robust to the influence of extremes and good for use with skewed variables . In addition, the test is highly resistant to the effects of outliers. The test was used to assess the presence of trends that is associated with the time series data. The rainfall records collected from Akure and Calabar showing the missing values is presented in Tables 2a & 2b respectively. Table 2a: Akure rainfall data showing the missing records. Table 2b: Calabar rainfall data showing the missing records. The analysis was conducted at 0.05 degree of freedom that is 95% confidence interval. Infilling of the missing records were based on the outcome of the correlation statistics which is critical to the fundamental assumptions of missing value analysis using expectation maximization algorithm. Results of the correlation statistics is presented in Tables 3a & 3b respectively. 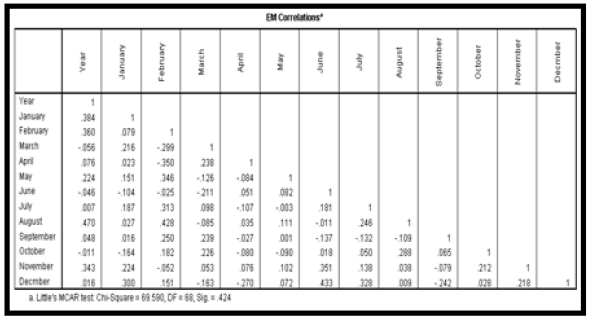 Table 3a: EM correlation statistics for Akure rainfall data. 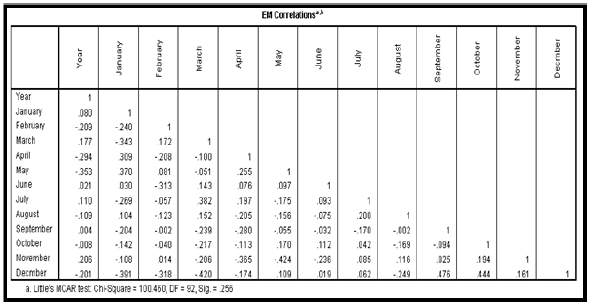 Table 3b: EM correlation statistics for Akure rainfall data. Table 4a: Extreme value statistics of annual rainfall data. Table 4b: Extreme value statistics of annual rainfall data. At 0.05 degree of freedom, any data lower than Q1 or greater than Q3 was considered an outlier . 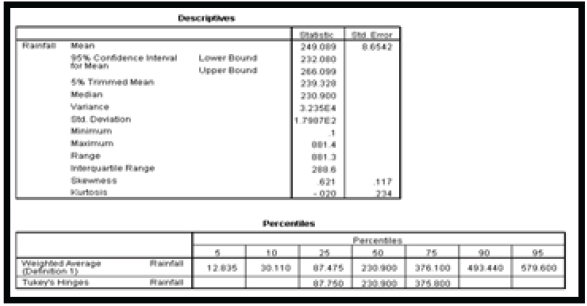 The descriptive statistics of the data based on the outlier detection analysis is presented in Tables 5a & 5b respectively. Table 5b: Descriptive statistics of Calabar rainfall data. Upper bound = 187.575 + (2.2(187.575 – 40.475)) = 511.195. The extreme value statistics of Akure and Calabar rainfall data which shows the highest and lowest case numbers is presented in Tables 6a & 6b respectively. Table 6a: Extreme value statistics of Akure rainfall data. From the result of Table 6a, it was observed that the highest rainfall value is 463.00mm which is less than the calculated upper bound of 511.195mm. The lowest rainfall value was observed to be 0.00 which is greater than the calculated lower bound of -283.145mm. Since no rainfall value is greater than the calculated upper bound or lower than the calculated lower bound, it was again concluded that the rainfall data from Akure is devoid of possible outliers. From the result of Table 6b, it was observed that the highest rainfall value is 881.40mm which is less than the calculated upper bound of 1011.075mm. The lowest rainfall value was observed to be 0.10 which is greater than the calculated lower bound of -547.50mm. Since no rainfall value is greater than the calculated upper bound or lower than the calculated lower bound, it was again concluded that the rainfall data from Calabar is devoid of possible outliers. To ascertain that the rainfall data are from the same population distribution, homogeneity test was conducted. Homogeneity test is based on the cumulative deviation from the mean as expressed using the mathematical equation proposed by Raes et al. .
For a homogeneous record, one may expect that the Sks fluctuate around zero in the residual mass curve since there is no systematic pattern in the deviation Xi’s from the average values . To perform the homogeneity test, maximum rainfall values were extracted from the monthly rainfall data and analyzed using the Rainbow software. Results of the homogeneity test are presented in Figures 2a & 2b respectively. 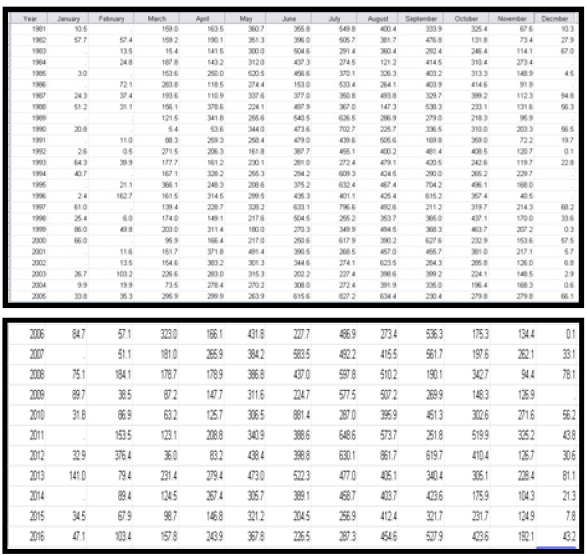 Figure 2a: Homogeneity test of Akure rainfall data. Figure 2b: Homogeneity test of Calabar rainfall data. The null and alternate hypothesis were tested at 90%, 95% and 99% confidence interval that is 0.1, 0.05 and 0.01 degree of freedom and results obtained are presented in Tables 7a & 7b respectively. From the result of Table 7a & 7b, the null hypothesis (H0) was accepted, and it was concluded that the rainfall data collected from Akure and Calabar, are statistically homogeneous at 95% and 99% confidence interval that is 0.05 and 0.01df. On whether the rainfall data employed in this research are normally distributed, normality test was conducted. 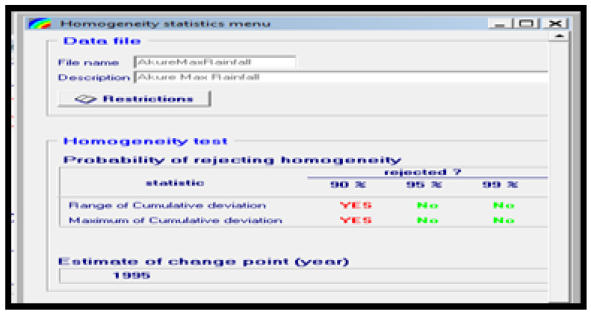 In addition to checking the distribution of the data, normality test was also aimed at selecting the most appropriate model for trend detection and estimation. If the data are normally distributed then parametric model such as least square linear regression will be most appropriate for trend detection and estimation otherwise non-parametric model such as Mann-Kendall and Thiel Sen’s slope estimation will be employed for detection and estimation of trend in the data. Table 7a: Extreme value statistics of Akure rainfall data. Figure 3a: Histogram of Akure rainfall data. Figure 3b: Histogram of Calabar rainfall data. 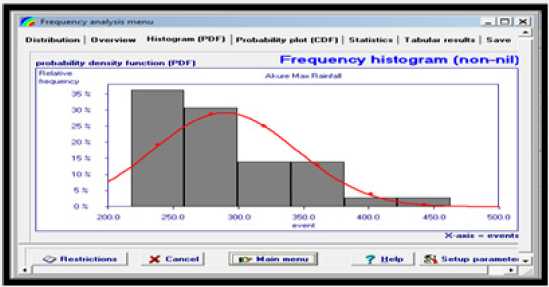 To validate the strength of the null hypothesis, normal probability analysis software was employed to test the normality behavior of the rainfall data at 99% confidence interval (0.01 degree of freedom). Result of the statistical analysis is presented in Figures 4a & 4b respectively Result of Figures 4a & 4b revealed that rainfall data from Akure and Calabar are not normally distributed at 99% confidence interval. The implication is that non-parametric test will be most suitable in detecting and estimating the magnitude of trend associated with the data. Figure 4a: Homogeneity test of annual rainfall data. 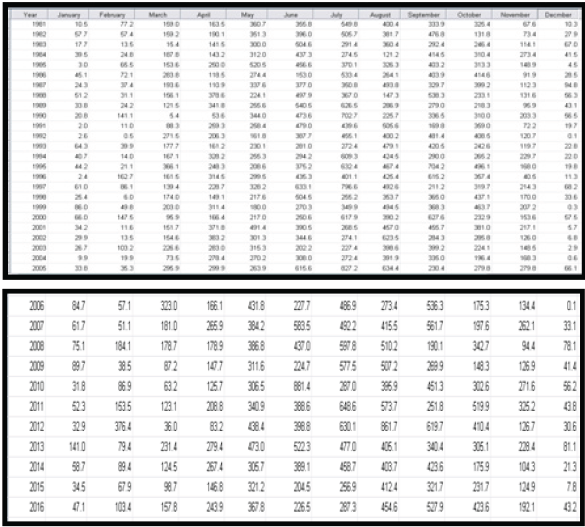 Figure 4b: Homogeneity test of annual rainfall data. 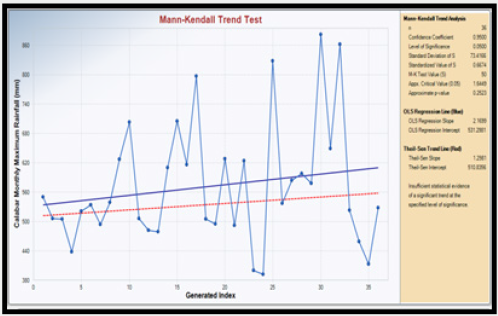 To perform the non-parametric analysis, the Mann-Kendall Trend test was employed. 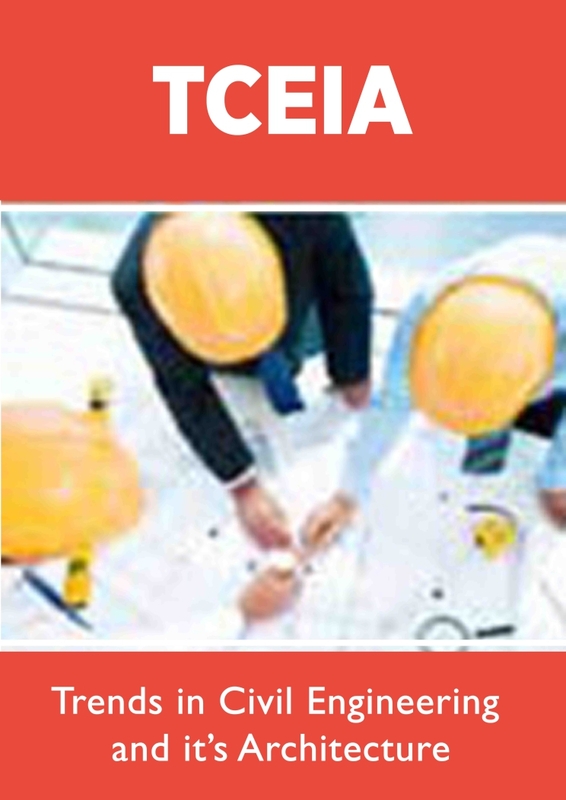 The test was conducted using Environmental Data Analysis Software (ProUCL). Results of the test are presented in Figures 5a & 5b respectively. From the results of Table 8, it was observed that there was insufficient statistical evidence of a significant trend in rainfall data collected from Calabar. That was not so with rainfall data from Akure as the non-parametric test result revealed a statistical evidence of a decreasing trend with M-K value index of -129. Figure 5a: Homogeneity test of annual rainfall data. 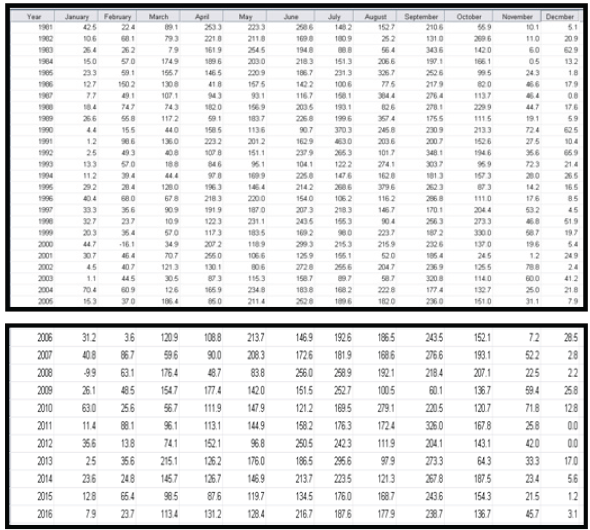 Figure 5b: Homogeneity test of annual rainfall data. Table 8: Summary of trend analysis of rainfall data. iii. Results of normality test further support the existing claim that climatic data are not always normally distributed owing to their stochastic nature. iv. Although, the non-parametric statistical analysis based on Mann-Kendall test revealed that statistical evidence of an increasing trend was observed in rainfall data from Akure, it was also observed that there was insufficient statistical evidence of a significant trend in rainfall data collected Calabar. Kerkides P, Soulis K, Psomiadis E, Giannoulopoulos P (2007) Water Resource Conditions Assessment in Greece and Their Role in Desertification. International Conference on Environmental Science and Technology pp. 123-156. Tsiourtis NX (2002) GREECE-Water Resources, Planning and Climate Change Adaptation. Water, Wetlands and Climate Change, The Global Water Partnership (GWP) and The World Conservation (IUCN) conference, Athens pp. 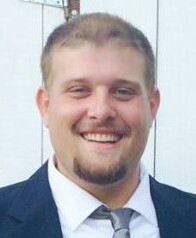 145-165. Ismail A, Oke IA (2012) Trend analysis of precipitation data in Birnin Kebbi, Nigeria. International Research Journal of Agricultural Science and Soil Science 2(7): 286-297. Ifabiyi IP, Ojoye S (2013) Rainfall Trends in the Sudano-Sahelian Ecological Zone of Nigeria. Earth Science Research 2(2): 194-202. Shishutosh B, Nitin M, Ng AWM, Perera BJC (2013) Rainfall trend and its implications for water resource management within the Yarra River catchment, Australia. Hydrological Processes 27(12): 1727-1738. 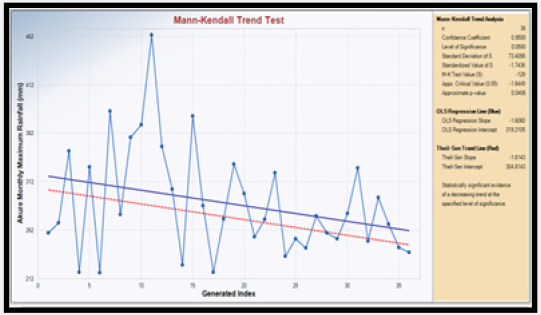 Hameed KH, Rao AR (2008) A modified Mann- Kendall trend test for auto correlated data.  Journal of Hydrology 204(1-4): 182-196. Marshall E, Randhir T (2007) Effect of Climate Change on Watershed System: A Regional Analysis Climate change. Journal of Earth System Science 23(1): 265-283. 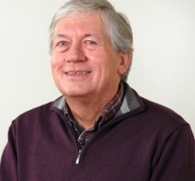 Lubes Niel H, Masson JM, Paturel JE, Servat E (1998) Climatic variability and statistics: A simulation approach for estimating power and robustness of tests of stationarity. Journal of Water Science 11(3): 383- 408. Alli AA, Oguntunde PG, Olufayo AA, Fasinmirin JT (2012) Implications of Trends and Cycles of Rainfall on Agriculture and Water Resource in the Tropical Climate of Nigeria. Special Publication of the Nigerian Association of Hydrological Sciences pp. 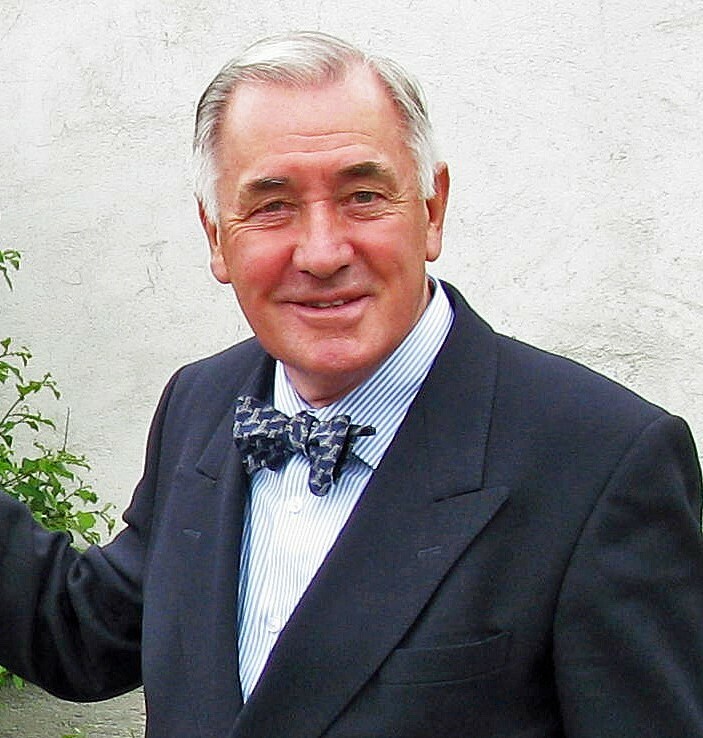 188-200. Levi DB, Julie EK, Olsen JR, Pulwarty RS, Raff DA, et al. 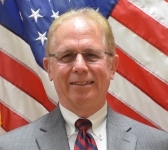 (2009) Climate Change and Water Resources Management: A Federal Perspective. Circular 1331 pp. 1-72. Raes D, Willens P, Gbaguidi (2006) Rainbow–A software package for analyzing data and testing the homogeneity of historical data sets. 1: 1-15.